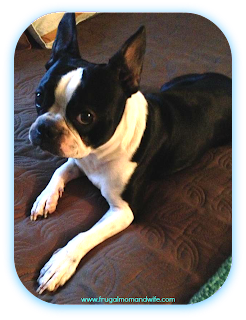 I love my Boston Terrier "Obi" but he can get super smelly. it absolutely needs to fit his unique personality. That's when I turned to the School of Wash. They offer a line of bath product for the whole family, including your pet. 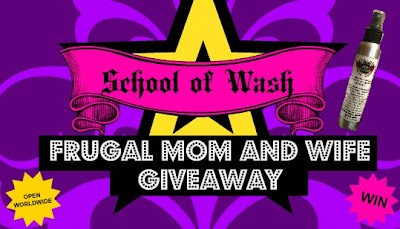 The School of Wash bath shop customizes your bathing with their unique Pick-A-Scent system. Handmade Bath products customized by you! Mineral Oil-free and contain no additives or preservatives. All products are made upon ordering and remain fresh for up to 1 year. Absolutely perfect for my family and my "Obi". LuLu’s Pet Wash is gentle and non irritating, it is also tear-free! Which its perfect for my Boston Terriers bug eyes, it won’t burn! it leaves your pets coat super soft, shiny, and smelling great! Obi definately smelled awesome and the scent was a perfect fit for his personality. 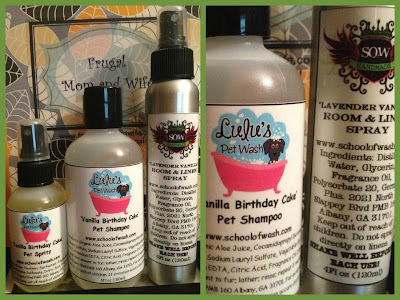 LuLu's Pet Spritz is like a cologne made especially for my little furry guy. He started strutting his stuff around the house right away. For those days when he's not so fresh, I give him a little spritz and he's good to go. LuLu’s Pet line is formulated to be SAFE for both dogs and cats! SOW Handmade Room & Linen Spray comes to save the day! It completely eliminated the smells and didn't just mask them like other products out there do. You can use that awesome in a spray bottle to freshen up anything!! I want to try the Lemongrass scent. Wow, they have TONS of scents! I think I would choose Drama Queen.